The most efficient way to manage your homeschool and homemaking is to get your kids involved. Did you know that researchers in Harvard found that children who were given chores became more independent adults? I totally believe this. I was pretty strict on my daughter when she was a teen. She had lots of responsibility as I worked full time and she was the oldest of three. It’s just what we had to do. She didn’t like it then, of course. However, things changed after she was out of the home. One day, out of the blue, she called me from her apartment that she shared with some other college girls. She began to tell me how much she appreciated me giving her chores and making her learn how to do laundry, clean, and cook. She said her roommates were super messy and even took their laundry to their parents on the weekends, not because their parents wanted to help but because they actually didn’t know how to do laundry. I had a moment of silence and almost cried. See, what we do in training our kids has a lasting effect on their lives. Although our kids may hate doing chores, assigning your children chores goes way beyond you getting some help around the house (which is awesome too, by the way). Many kids grow up and have to teach themselves basic life skills they could have easily learned while they were under your care. If you are wondering if you should give your children chores, the answer is YES. Yes, you want your kids to enjoy their childhood but not giving them responsibilities is a great disservice to them as they grow older. I have read that chores are the best predictor of which kids were more likely to become happy, healthy, and independent adults. Let’s explore why. Assigning chores to your children can help you plan your homeschooling and homemaking more efficiently. Kids feel confident when they do chores, especially when you show them how much it means to the family. Whether it’s making their bed or sweeping the floor, you are building your child’s confidence for them to know they are indeed capable of getting the job done. Chores help with team building. Kids aren’t just born into a family without responsibility. A family unit is a team. Working together will help your kids understand the value of teamwork and that they are crucial to making the home flow smoothly. Being a good citizen can stem from you giving your child chores This will also encourage participation in their future endeavors. They feel as if they can make a difference, and they can! Chores help build life skills. I was reading a comment on a blog where a daughter stated her mom did everything for her and her brothers. However, when she got older she had to learn life skills on her own. She said she is definitely giving her kids chores because not having them has negatively impacted her as an adult. One of the most evident causes of over-indulgence of adults is parents doing too much for them as kids. You want your kids to function well in the outside world, don’t you? Then equip them with what they need to survive out there. It starts with self-care, responsibility, and learning to do minimal tasks like iron, cook, and clean; all of which can be taught by assigning them chores. Chores can help build your child’s self-esteem. When your child completes a chore, it gives you the opportunity to praise them for a job well done. They can be struggling in a subject or not doing too well at a sport they love, but even in little things like contributing to the home can give them a sense of feeling appreciated. I honestly, love to notice one of my children’s chores done well. I make sure they know how much I appreciate it. They love to help mom and know that mom appreciates their help. If you don’t assign your kids chores just yet, incorporating them into your homeschool day can be the best way to introduce them to your kids. It truly is our job to prepare our kids for life. We have so many opportunities to include our kids into taking care of the home that it would be wise for us to plan it out. Homeschool Planet has a built-in option for you to make sure your child can incorporate chores into their homeschool day. It is quite useful and helps kids to know that chores aren’t just another thing to do but are part of what they do during the day. Chore time can be counted as school time which may shift your child’s perspective some. Homeschool Planet offers a chore and household organizer that can be tailored for each of your student’s calendar. When your child logs in, they will be able to see their weekly or even daily schedule and what chores you have assigned them for that week or day. Making chores a part of their daily routine will help you manage your homeschool and homemaking easily. It may not be easy at first to get your children to want or to even enjoy doing chores but it is worth every effort to prepare them for life. 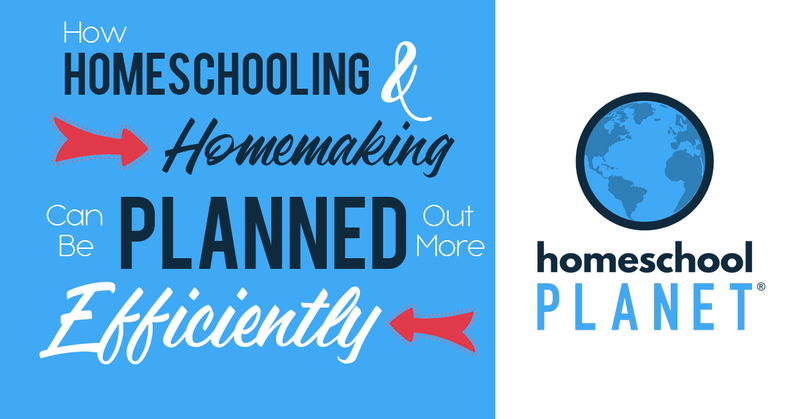 Use Homeschool Planet to organize your homeschool and your homemaking schedule all in one place. Count chore time as school time so that your child will not see homemaking as something they dread but as something they contribute to. Set a certain time for your family to complete chores during the day. Make sure to show your family how much you appreciate their contribution to homemaking. Try to also do your chores at the same time as your kids. Work alongside them, it will really help motivate them and YOU to make it part of your daily routine. If at all possible, try to make homemaking fun. Make it a race or give awards for weekly accomplishments both in homeschool and homemaking. There is definitely a way to make Homeschooling and Homemaking Planned out More Efficiently. It takes some effort and it takes involving kids no matter what their age. 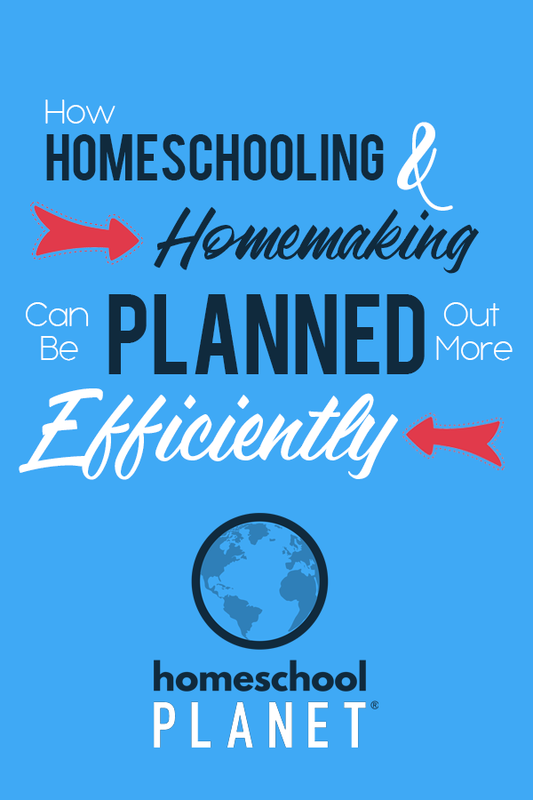 Being efficient in your homeschool and homemaking takes the whole family. Plan out your homeschool and homemaking schedule with Homeschool Planet’s organizer and take the stress out of trying to handle it all on your own.